(2016). Sonosynthesis and characterization of nano ZnO/Montmorillonite nano clay composite via Sol-Gel method. International Journal of Bio-Inorganic Hybrid Nanomaterials, 5(3), 167-172.
. "Sonosynthesis and characterization of nano ZnO/Montmorillonite nano clay composite via Sol-Gel method". 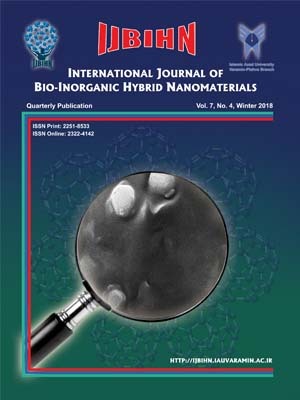 International Journal of Bio-Inorganic Hybrid Nanomaterials, 5, 3, 2016, 167-172. (2016). 'Sonosynthesis and characterization of nano ZnO/Montmorillonite nano clay composite via Sol-Gel method', International Journal of Bio-Inorganic Hybrid Nanomaterials, 5(3), pp. 167-172. Sonosynthesis and characterization of nano ZnO/Montmorillonite nano clay composite via Sol-Gel method. International Journal of Bio-Inorganic Hybrid Nanomaterials, 2016; 5(3): 167-172. Nano ZnO/ montmorillonite composite were prepared by sol gel method under ultrasonic irradiation from directly mixing montmorillonite nano clay into Zinc gel. The Zn(CH3COO)2.2H2O and montmorillonite nano clay was used as precursor. The zinc acetate was dissolved in DI water and, NH3 (aq) solution was dropped into the zinc solution until pH 9 consequently the zinc gel was produced. The montmorillonite nano clay was mixed into Zinc gel, after stirring for two days, the mixture was irradiated 30 min by ultrasonic probe. The filtrated composite gel was calcinated at 400°C for 3h in furnace. The morphology of prepared catalysts were characterized by field emission scanning electronic microscopy (FESEM), Fourier transform infrared (FT-IR) and X-ray diffraction (XRD). The XRD patterns confirm that synthesized catalysts had highly crystalline nature. The calcination temperature of 400°C and aging time of 48 h for preparation of this nanocomposite was found to be the optimum condition.